We, as a group, seem to be slipping on all of these things, and I know it leads to me checking in and posting less often (which, admittedly, may not be entirely a bad thing). And I feel much happier now that I only come on here and skim once every few days. Admittedly I use this forum to blow off steam after a loss. It’s usually where I like to express my knee jerk reaction to things because I know it is among others that share a similar sentiment. The biggest problem is that most of what many post are opinions and it turns into arguments over who’s opinion is more right than the others. 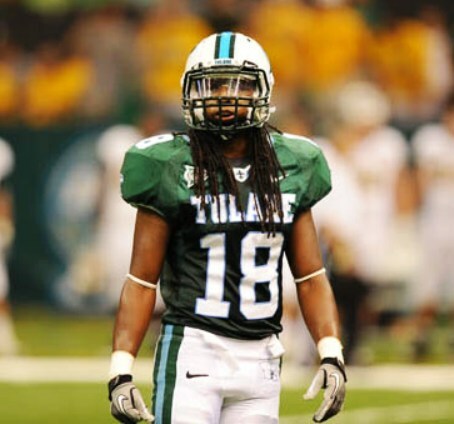 It will get better because Tulane is getting better. We will return to our winning ways and when we do, it will be sunshine and roses! .... it will be Herradura Ultra Añejo shots and cold beer. I am proud to say that I am Dr. Victor J. Law. My handle of pcwave is because I live in Pass Christian, MS. My previous handle was Harahan Wave. I lived in New Orleans and Harahan for many years and I taught Chemical Engineering and Computer Science for 41 1/2 years. My first Tulane game was in 1949 in Mobile, AL where the Wave took the Crimson Tide to the woodshed. After that I was a boy scout usher at Tulane games for several years. In 1956 I entered Tulane as a Freshman and graduated in 1960. Stayed on in graduate school getting an MS in 1962 and a Ph.D. in 1963. By fate I was offered a position on the faculty of Chemical Engineering, later founded the Department of Computer Science, returned to Chemical Engineering in 1988. I retired in 2014 and now live in Pass Christian. To say that Tulane has been the focus of my life would be an understatement. My love for Tulane leads me to beg all posters here to not be involved in PERSONAL disagreements (or even attacks). State ANY and ALL opinions but please keep away from attacking other Green Wave fans. I love Tulane and all of its fans. I Like your post Dr. I try to be nice to everyone. Except referees and umpires and game officials that make bad calls against us. And Houston fans. And Houston players. And Marshall in the old days. And anything having to do with Louisville. Or lsu. Or ull. And smu coaches. And navy linemen who chop block and hold and generally play dirty. I suppose I have been a little uncivil in posting about uno fans too. Maybe fsu too back when we played them. But other than that . . .
Great stuff, Dr. Law. I took an introduction to Fortran course in your department in 1974 so we are related in a Kevin Bacon sort of way. I suspect the reason most here "blow off steam" is a personal psychological fitness exercise performed consciously or unconsciously. How so? Well most of us don't have very many, if any, people within ear's reach who know very much about Tulane athletics. We understand that our strong feelings, opinions, and conclusions could use social review and critique. This is a healthy process. Any psychologist worth his salt will tell you that people do well to talk their ideas out. This is our way of doing just that in a specific place where we know people have approximately the same investment in the subject at hand. For that reason I don't take the "blowing off steam" as complaining, but more as having healthy conversation. Further I prefer the Yoggie board to the Toola board because the posters that 'are happy only when they not happy' seem to have settled there. So PCWAVE - you may remember my Dad - Dr. Tom Assad, English Dept. Growing up on campus as kid, I knew all the holes in the fence around Sugar Bowl stadium, sold coke at Saints games, after parking cars at our house. Attended most BBall and Football games since I turned 11. Was there in 73 for the big win. redemption after 25 years - was sweet. Certainly remember O'Boyle, Pittman - promising teams, then we opened up with Alabama and Texas, always lost some 1st team guys in the first two games that killed the season. Remember Blue Chip recruits who committed to the Wave, then went to LSU because their Dad miraculously got a high paying job on the Rigs. We all bleed green! We all have "history". The Wave is finally turning the corner. Lets all enjoy the ride like true Tulane Fans. I live and work in Rhode Island, but my heart is still in NO. and I will always follow the Wave - glad to see the revival - it has been a long wait! Lets act like true Tulanians on this forum and follow the rules. Your Dad was also a great Handball player. He was there as much as I was and I was there most every day. Getting a little snow today ?? An impressive success story IMHO. Thanks, Doc. The best is yet to come. Some great stories above. Thanks. They remind us that coming here is supposed to be fun. We all have high expectations and ask for performance on those and holding those in power accountable. Simply let's do it with class. We all have opinions on same which often differ. Instead of handling those collegially, too often this site descends (and I'll confess to have regretfully participating) into harmful bickering, last wording and yes that 21st digital media phenomenon, anonymous trolling. I root for Tulane and I want to see it win. Meanwhile I like to have fun doing it. Roll Wave! SR - Dad could play handball. i could never beat him nor did many other folks - Dean Taylor / Navy Rotc - found out the hard way in a public challenge during my tenure at TU. Dad played him with one hand tied behind his back. I think Dean got 7 points over 2 games. - little do most folks know - he had a collapsed lung and minor heart attack at 46, while he was still smoking. had to start walking - then decided to run. Then after his daily 5 mile run - was asked to play in the open air courts back in the 60's. eventually ran 5 miles daily and then played handball afterwards. His endurance usually was the deciding factor in most games...played into his 80's. Joey Hero - nationally ranked player in the 60's, would show up occasionally. he was tough to beat - so was his son - who got a scholly to Tx. I went on to play in NY / NJ, but never ranked. been out there to shovel 3 times today - still snowing the beat the band- calling for 18 inches - we'll see! I watched your Dad many afternoons in those open air courts. Never knew he ran 5 miles before handball. That's insane. Dean T and I were on the same Intramural BBall team. Just a super guy and one of the best overall athletes I've been associated with. Did you know Ron Shaeffer(sp) who was in the PE Dept back then. I know he had HB games with your father for a couple of years. I will just point out that the losing across sports is worse than it's ever been...the only team to make post season the last 2 years is men's tennis (I'm confident they'll make it this year). It's inexcusable. And, frankly, Dannen seems as oblivious about it as Dickson. I'm holding my self back re my "discourse" especially regarding well-funded sports that don't show up to play 1/2 the time. But it's not easy. A refreshing culture of standards, expectations and accountability is upon us. The board may reach thrilling new lows after tonight's baseball game ends. Will be depressingly quiet around here. I agree for the most part. As for the draft issue maybe my memory is off but who were those first and second rounders? We have had a lot of guys drafted but I don't remember us regularly having first and second rounders.